Violence… plunder… feuding… it all went on at Cardoness Castle. A mile or so from Gatehouse of Fleet in south-west Scotland, this was the seat of the McCullochs, a notoriously lawless bunch. The family name began with Godfrey McCulloch, a warrior during the Crusades, who carried the emblem of a wild boar (in Gaelic, ‘cullach’) on his shield. Cardoness Castle passed to the McCullochs via the marriage of an heiress. An old story tells how this girl was the sole survivor of an accident that killed her eight sisters, as well as her mother, father and new-born brother. The laird of Cardoness had been celebrating the arrival of a son by holding a party on the frozen loch; but the ice gave way, drowning all but one daughter, who went on to marry a McCulloch. Successive McCulloch lairds were convicted of violence and theft of property, with one Ninian McCulloch even stealing 1,500 head of cattle from his own mother in 1501. Alexander McCulloch clashed repeatedly with his neighbours before perishing on Flodden Field in 1513; and one of his descendants, the swashbuckling Alexander ‘Cutlar’ McCulloch, took to sea and led several raids on the Isle of Man. 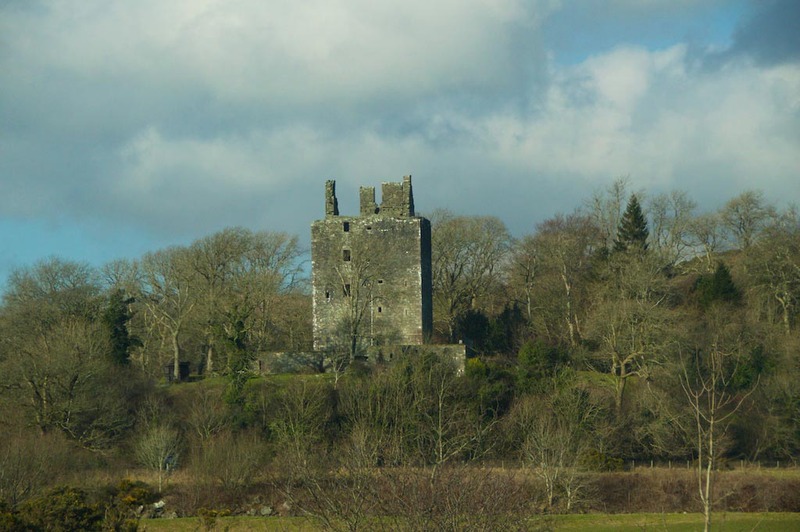 In 1628 Cardoness Castle passed to the Gordons, a neighbouring family who had a centuries-old feud with the McCullochs. The McCullochs didn’t take this lying down: in 1668 Alexander McCulloch burst in on the ailing widow of John Gordon, and threw her onto a dung heap; and in 1690 Godfrey McCulloch shot and killed John’s son. Godfrey fled to France, but was silly enough to venture back to Edinburgh, where he was spotted and executed on the ‘Maiden’, Scotland’s version of the guillotine. After that little episode, perhaps thankfully, the castle was abandoned and left in peace. I think I have found more interesting locations (well for me) on blog pages than in the guide and tour books! On another note – they are an interesting family even if they are a bit mean! I visited Doune Castle on my little Scotland jaunt last week, such a nice place and wonderful to explore. Haha, very true! 🙂 Glad you enjoyed Doune – one of my favourites! Phew! We have a good friend McCulloch, and a nicer, kinder, gentler, more law-abiding chap you will not meet! Love the story, though. That could explain a lot, Andy! 🙂 Yes, it’s hardly surprising that people didn’t live very long in those days. Talk about a wild bunch! Well, it’s a beautiful old ruin, anyway. Hope the McCullochs are resting quietly. The Victors always write the history! That’s all I can say! God Bless Great Granddaddy & Gandmommy!